Directors – Ching Siu-Tung & Raymond Lee, Screenplay – Hanson Chan, Tang Pik-yin & Tsui Hark, Producer – Tsui Hark, Photography – Lau Moon-Tong, Music – William Wu & Richard Yuen. Production Company – Golden Princess/Long Shong Pictures/Film Workshop. Imperial officer Koo accompanies a contingent of Dutch soldiers to the grave of Asia the Invincible. In reality, the traitorous Dutch have come in search of the Sacred Scroll. They are attacked by an old man who guards the Black Cliff temple. Koo realises that the old man is a disguised Asia. Asia spares Koo after he tells her how people across the land are pretending to be Asia or to speak for her. Asia sets out with Koo, determined to kill these impostors. A war erupts between impostors, the Sun Moon Sect, the Dutch and the Japanese ninja. In the midst of this, Koo falls in love with Snow, one of the impostors. This was the third of the trilogy of films begun with Swordsman (1990) and continued with Swordsman II (1992). This third entry reunites most of the key personnel from Swordsman II – director Chin Siu-Tung, producer Tsui Hark and star Brigitte Lin. Swordsman introduced the basic tropes and acrobatic moves that quickly became the mainstay of the modern flying swordsman genre. Swordsman II scaled these up with a wild imagination and is one of the finest of all Hong Kong’s Wu Xia films. 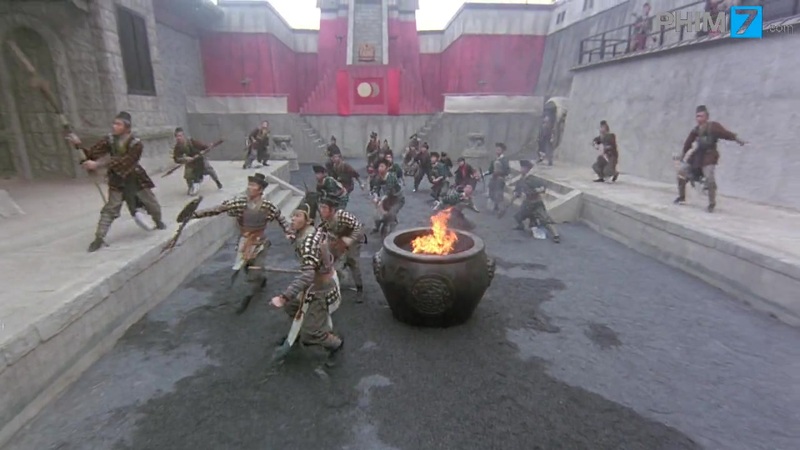 With Swordsman III: The East is Red, the attempt is made to top Swordsman II, resulting in a film that is utterly whacko even by the usually OTT, anything-goes standards of Hong Kong fantasy. Characters toss needles that pierce cannons, while the cannons themselves are hand-wielded as though they were machine-guns; combat takes place atop waterspouts and on the sails of ships. The film seems to specialise in gonzo inventions – a sailing ship that rotates its panels and then sinks beneath the waves to become a wheeled submarine that then emerges up from underneath enemy sailing ships; one swordsman wields a 20 foot long sword that coils up into jointed pieces; a dwarf that disguises himself inside the armour of a normal-sized samurai. The most bizarre image is that of Brigitte Lin riding into combat on the back of a swordfish leaping out of the ocean – a point where the film’s already tenuous suspension of disbelief seems in danger of toppling over altogether. Playing on the nutty martial arts moves that fill Hong Kong fantasy, much comic potential is made of a move that can shut down a person’s heart valves. The story, filled with numerous factions and impostors, is hard to follow but then that isn’t why people are watching this film. Brigitte Lin and Joey Wong are clearly having a good deal of fun together with their sly looks.